Paper shredders are one of the most elemental tools as far as keeping company records confidential is concerned. For this reason, there are numerous purposes why one should undertake paper shredder reviews. This is because cutting paper into extremely tiny pieces is one of the ways in which companies are able to ward of identity theft. Reviews are important especially because they provide a guide for consumers so that they are able to make the right decision. While this is not a fool proof method of selecting what best suits a client, it is definitely an invaluable source of information as it gives an understanding of what one should expect when they get themselves a given brand. What should you consider when looking for shredder services? 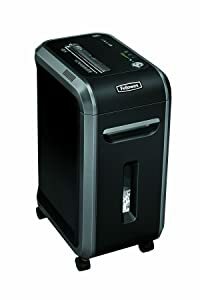 The Fellowes Powershred W-11C Cross-Cut Shredder is a deskside shredder for home or office use and for individual users handling sensitive information. The cross-cut type of cutting that the W-11C employs is ideal for use on junk mail, insurance papers, and college and credit applications, shredding an 8.5×11-inch page into 399 particles. If you are handling sensitive information, it is best that you choose a shredder at least like the Fellowes Powershred W-11C Cross-Cut Shredder because of its cross-cut shredding feature which offers a security level of three out of six. My review about the Fellowes Powershred W-11C Cross-Cut Shredder is essentially good, with most rating the product with no less than four stars out of five. What a lot of them are saying though is that this shredder from Fellowes gives you great bang for your buck because it is so affordable yet it performs close to what you would get from a paper shredder three times its price. You’ll run into a little bit of a problem if you try shredding CDs (actually, don’t try shredding CDs with this one) or corrugated boards. It will do good work of credit cards, invoices, unopened junk mail, and even adhesives though. Just make sure that the adhesive you are trying to shred is stuck first on a piece of paper. Because of the cross-cut type of cutting used by the Fellowes Powershred W-11C Cross-Cut Shredder, shredded paper packs down very well and stays down when used for other purposes in the yard or garden. While paper disposal is simple enough since you just have to lift the bin out, some people still have a bit of trouble because you have to lift the shredder up before you get to the bin and the shredder is heavy with a shipping weight of 15 pounds. Shredders are generally not quiet machines but some reviews have commented that the W-11C operated more quietly than others. The cutters come with a three-year warranty from Fellowes and so far reviews are saying that they’ve reached nearly two years of use and yet the Fellowes Powershred W-11C Cross-Cut Shredder still works like it’s new. This shredder is pretty cheap so it’s great for anyone who needs to work with a budget. But whatever you spent on this Fellowes shredder, it’s worth every penny you had to shell out. 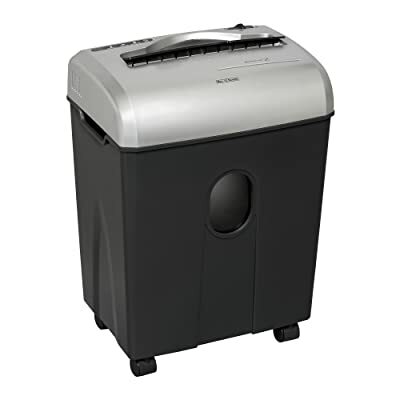 The Fellowes PowerShred 99Ci Cross-Cut Shredder is 100% jam free because it electronically measures paper thickness. If you put in too much paper then it will stop before any jamming occurs. It also uses something that is similar to a traffic light since a green light symbolizes you can still put paper while a red light signifies the machine has been overfed. The uniqueness of its safety technology immediately disables the paper shredder when hands are near the paper opening. The SilentShred feature allows quiet shredding so you won’t have to worry about anybody getting disturbed whenever you plan to shred paper. The Fellowes PowerShred 99Ci Cross-Cut Shredder is built to last a long time so you won’t have to worry about buying another shredder for a very long time. It is made out of a powerful motor and parts that were made to outperform similar models. It also ensures confidential documents will be reduced to unreadable material. It can also cut into CDs, DVDs, staples and credit cards. The pull out bin is also easy to pull out whenever you decide to switch the waste disposal. The warranty is lifetime for the cutter and 2 years for the product and service. All the reviewers are extremely satisfied with their purchase of the PowerShred 99Ci Cross-Cut Shredder. A lot of them say it is the best shredder they have ever purchased because they did not encounter any problems whenever they decided to use it. They praised the Safe Sense technology because the fingers of their children will still be complete until they grow up. They know that accidents are waiting to happen whenever their children come near the shredder. It is so quiet you will only hear the sound of the blades destroying whatever you are feeding it whenever it is operating. One reviewer says the design is very smooth which does not make it difficult to use. Another reviewer says the only thing that might turn off buyers is the price. However, if you are a smart buyer then you should be after the quality since cheap products will break down after a few uses. Every office needs a paper shredder and the PowerShred 99Ci Cross-Cut Shredder is perfect for that. You will never have anything bad to say about this product because it serves its purpose. It will also not let you worry about any type of accidents happening anytime soon which would be good because you can be confident this shredder is your friend. Another reviewer said this shredder is excellent and it deserves to be recognized as one of the top products of the year. Protecting personal information is of utmost importance these days when many of your transactions are done online and identity theft occurs unexpectedly. The Fellowes Powershred DS-1 Cross-Cut Shredder is ideal for safeguarding information such as junk mail, insurance papers, or credit/college applications. It cross-cuts up to 11 12-foot sheets of paper in a minute under a maximum running time of 4-5 minutes, producing a throughput rating of 660. The shredded pieces are 5/32 inches by 1-3/8 inches and go directly to a step-release mesh bin. The machine can also cut through tougher materials such as credit cards, paper clips, and staples, allowing you to shred and clean up efficiently without going through trivial tasks such as taking off fastened staples and clips or opening envelopes containing cards. With such machine at your command, you can quickly and safely dispose items that hold private or dispensable content. 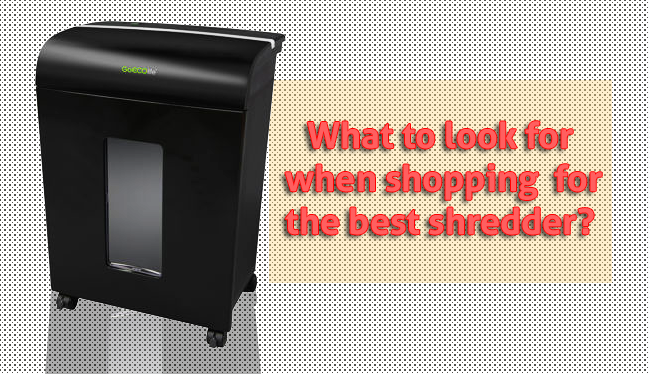 The Fellowes Powershred DS-1 Cross-Cut Shredder mostly gets a positive review for its design and price. This shredder features an industrial look that does not easily wear and fits well in most rooms whether they are in the office or at home. The price is affordable and offers good value as it gets rid of a huge number of unwanted documents in a short span of time. Consumers are advised to follow manual instructions, on the other hand, and observe a cooling period after 4-5 minutes of usage to avoid any malfunction. The shredded pieces ought to be thrown as well before they max out your wastebasket or you will end up with amounts of confetti on your floor. If you are working in a company which produces only a small amount of disposable files or you need a shredder for home use, this is a competent and reliable equipment. The slot is large enough to easily accommodate the prescribed items. Some customers who use the machine in offices have raised issues on its capacity to handle larger amounts of feed, however. Its sound, likened to a vacuum, may also be a little bothering in a quiet area. The Fellowes Powershred DS-1 Cross-Cut Shredder is sturdy enough though and runs well with a regular dose of lubricant. Parents get some peace of mind with its SafeSense Technology that makes using the equipment a non-hazard with kids around. At 4.75 gallon, the wastebasket does not have to be emptied too often and gives a clear enough view of what you have disposed. Overall, the Fellowes Powershred DS-1 Cross-Cut Shredder is a good deal for its price, safety standard, and design. If you are ready to step up to a more powerful paper shredder or need to replace a current one, then check out the Fellowes Powershred 79Ci Cross-Cut Paper Shredder. It is more expensive than the everyday shredder but you will get your money’s worth with this machine. If you need to shred large amounts of paper or even CD’s, consider the Fellowes Powershred line. The need for a paper shredder may only occur annually for personal reasons or on a daily basis in the work place so certain features should be considered. The most important factor is that the shredder gets the job done without any hassles. Paper jams, overheating and having to constantly empty out a too small wastebasket wastes time that could be used for other tasks. With the 79Ci, you won’t have any of these issues. 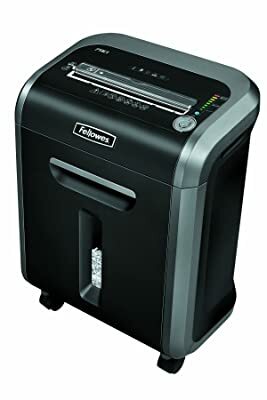 We found Amazon.com is offering a 60% discount on Fellowes Powershred 79Ci Cross-Cut Paper Shredder. Some paper shredders are very basic and some have a number of features that you may or may not ever use. Consider your past shredding needs and what you needed during those times and what you expect in the future. Do you need extra security with your shredding? You’ll prefer a cross-cut design. Do you need a larger wastebasket? Is 6 gallons sufficient? Do you have a lot of paper to shred and get frustrated when you put too much paper in and the unit jams? You need a jam-free model. 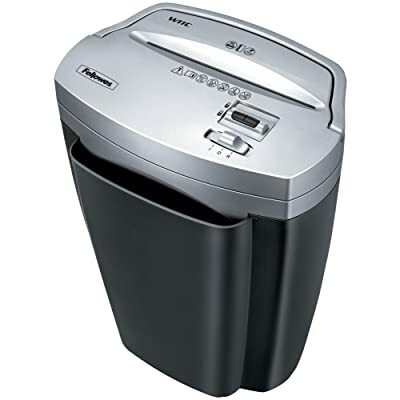 If so, Fellowes offers the following in their Jam Proof 79Ci shredder. Fellowes has created a unique system that is designed to never jam when shredding paper, CDs or even credit cards. On the top of the 79Ci, you will find an indicator light that will advise how much more paper you can shred at one time. If the indicator light is green, it’s safe to add more. If the indicator light is red, then you’ve reached your limit or you need to remove some. The 79Ci has a sensor that will let you know, through the indicator light, if you can add or need to remove excess paper. For safety precautions, the 79Ci also offers Fellowes SafeSense(r) technology. A sensor located near the paper opening will automatically shut off the shredder if something other than the allowed items begins to enter into the slot. In regards to noise levels, the 79Ci is super quiet as it comes with Fellowes SilentShred performance technology. 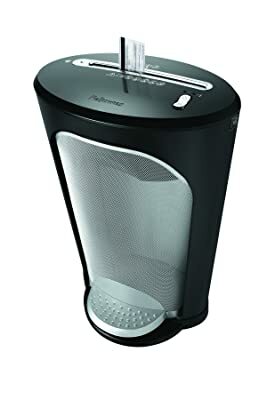 To make the Fellowes 79Ci even better, it comes with replacement bags for the waste bin and a small bottle of oil for the shredding “teeth” of which it’s recommended to oil at every bag change. The 79Ci is 21.5 x 15.3 x 12.19 inches and weighs about 33 pounds which is why casters were added. When deciding which shredder is best for you, the security level and down time are probably the two most important features to look for. The 79Ci offers a security level of 3 which is quite high and this is achieved by the cross-cut action the paper receives. Down time from unnecessary jams is eliminated by Fellowes sophisticated technology. Although the price is a little steep, the durability and the features that the Fellowes Powershred 79Ci Cross-Cut Paper Shredder offers make up for it. The Aurora AU1215XB Cross-Cut Shredder is a medium-duty shredder and versatile for home or for a smaller office. This particular unit is reasonably priced and offers several shredding options to meet every shredding need. To ensure every user has access, casters allow the mobility of the shredder. The Aurora AU1215XB measures approximately 8.9 x 12.5 x 17.5 inches and weighs under 18 pounds. The blades are designed to shred paper material into 7/32 x 2 5/32 inch strips. The AU1215XB will shred approximately 600 maximum number of sheets per day or shredding 25 up to 50 times per day. In regards to shredding CDs, these are cut into 4 sections so if you need the pieces smaller, you would need to reinsert them into the CD slot. In addition, Aurora’s ShredSafe Active Safety patented feature will automatically stop the shredder when a foreign object enters into the feed slot or if there is a paper jam. There is also an overheating feature that warns the user when the unit is reaching its maximum internal working temperature. This feature is important especially during large shredding tasks. All of the controls as well as the LED indicator lights are located on the top of the shredder which is where the motor is located. To empty the wastebasket, there is an area behind the feed slot in which you can insert your fingers and lift the motor off. To move the shredder, there are finger slots on both sides at the top of the wastebasket but just under the motor assembly. On the front of the wastebasket is an oval shaped window in which you can determine if the wastebasket is in need of disposal into the recycling bin. The looks of the AU1215XB are clean as the top portion in which the motor/shredding apparatus is located is silver while the wastebasket and casters are black. The controls are easy to read and use. The upper left corner contains the indicator lights for “OVERHEAT”, “OVERLOAD”, “MISALIGNED” and “AUTO”. The Auto feature allows you to keep the main power switch on and when the shredder is not in use, the shredder will go into a “sleep” mode as an energy saving feature. The AU1215XB is perfect for home use, for businesses with a few employees or for offices in which the shredder is designated for two or three employees. The price is reasonable for this type of shredder and there is a limited 5-year warranty on the steel cutters while a 1-year warranty covers the rest of the parts. The Aurora AU1215XB Cross-Cut Shredder offers all of the necessary features and the quality that are needed for typical shredding needs. Quite a number of offices and establishments still use paper shredder services to eliminate the risk of sensitive and crucial information landing in the wrong persons. This is why it is important that one is keen when seeking for shredder services. It is interesting that even with advancements that have been made on the technological front, paper shredding is still an important aspect of such office practices. Of course there are alternatives such as burning the papers or material containing the information, but for some reason, many offices still prefer the use of paper shredding. A keen look at the factors that make this a preferred method of getting rid of information is quite insightful. As a result, listed below are some crucial factors that must be put in mind when shopping for shredder services. Why get a company that provides? One may seek to find out why these services are existent in the first place, especially considering that a paper shredding machine is, seemingly, not as costly as many of us would think. Even though a number of the companies that seek shredder services could well afford the cost of the machines, many prefer to outsource such services for a number of reasons. One of this and the most important is that such companies are able to provide security. Remember that shredding paper is done to prevent unauthorized people from getting access to information. With such providers, security is guaranteed, enabling the client’s management to function in peace. In addition, the risk of losing such information does not warrant the cost of procuring such services. Another reason why you will come across many firms seeking shredder services is because, depending on the type of company, in some cases the backlog of paper work is too much. In such a case, instead of hiring someone to do that job, it is usually easier to outsource for a shredder provider. This not only saves time, it also allows the company’s management to channel their funds to other projects at hand. Another advantage of sourcing for shredder services is that this opens up the company’s network systems. It allows the company to get contacts that could open up business deals which last a life time. When used well, this is a key marketing tool that companies could use to their own advantage. Entrusting private and confidential documents and other non-paper items such as credit cards to anyone can be very daunting particularly for people who are doing so for the first time. To prevent getting duped by the many con artists who have flouted the market, it then becomes imperative to go through the reviews for the companies that provide shredder services. This will give a general idea of what kind of business deals one is getting into. This is not to say that ‘small companies’ do not offer recommendable services, but often, it is better to go with reputable companies. In fact, some of the companies offer such excellent services that upon completion of the shredding job, the client gets a certificate of destruction. The advantage of issuing a certificate is that it becomes a legal document that shows there was a contract between the two participating companies. It also comes in handy when one is seeking for shredding services in the future. Some shredding service companies give discounts for regular clients. All these are important factors to ensure that one gets the ideal services; services that guarantee peace of mind as well as secure disposal of crucial documents. 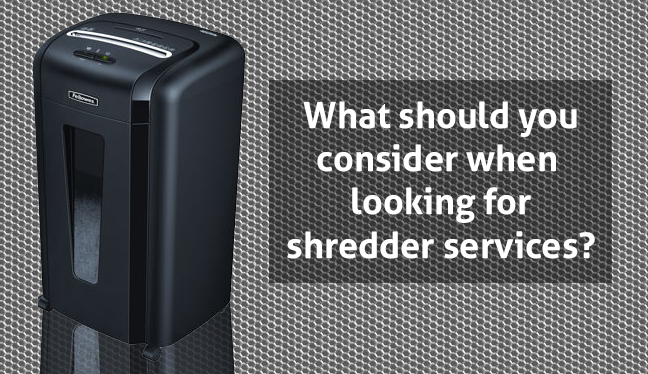 Just as with any other product, choosing the best shredders simply boils down to the job at hand, and ultimately, what it is that the client would want. While this may seem as an easy task, it is actually an involving one as it encompasses various factors that must be put into consideration. With the availability of numerous brands in the market, it is little wonder that getting the best shredders does not come easy. Listed below are some of the factors that must be put in mind when determining what shredder is best placed for what job. This is rather simple since it involves classifying the shredder in two major groups; small scale use and large scale use. Small scale refers to the use of shredders such as is the case in home offices and small and medium enterprises. Essentially, what this means is that the workload of papers to be shredded is not as much as is the case in a large scale setup. In the latter, paper is shredded in a massive scale. Perfect example of this is in industries where the amount of material handled is obviously greater. For the best shredders, it is of paramount importance that the set up is factored in. Along with the setup in which the shredder is to be used, the next factor to be considered is the volume of paper that will be handled. Be sure to check the number of papers that the shredder can work on in a day. For a more scrutinized approach, consider how many sheets of paper that can be shredded at a go, usually referred to as the sheets per pass. It is crucial to note that even with the best shredders, improper care leads to burn out of the shredder. Be sure to check the specifications and work within the set limits if you want to get the most out of your appliance. The throat in a shredder refers to the opening from which the paper is inserted. Logic follows that the smaller the throat, the more the paper has to be folded. Again, this is highly dependent on the setup in which the shredder is to be used. For the best shredders, ensure that the throat matches the setup. Depending on the brand of the best shredders that a client has chosen, some will come with a host of extra features, all of which are designed with the aim of making shredding a relatively easy activity. Some of these features include an automated button that starts and stops upon detection of paper. This is an innovative approach to shredders since it reduces the risk of injury to the user. Another feature that some brands have incorporated in the shredders is a buzz whose sole purpose is to alert the user that the shredder has malfunctioned. Malfunctions will usually occur as a result of too much paper in the shredder basket. Another alternative to this is the use of Reverse Feed, a mechanism which allows the paper to be cleared out, in effect eliminating the jam that causes the shredder to malfunction. In the extra features, some shredders will include the capability to handle staple pins as well as other non paper items such as expired credit cards. All these are factors which, if carefully considered, will allow the client to get the best shredders at the best deals. So, why not get shopping? Look around for the brand that will perform beyond your expectations.